The symbol for Manhattan Presbyterian Church is a rooster clinging onto the cross. This symbol does not originate with us; the logo has been used before and this specific design (we added a more distinct cross) was gifted to us by City Pres in Oklahoma City, a church within our denomination. The image itself is much older, drawing it's meaning from the Scriptures. Simply put, the rooster is picture of God’s grace to sinners. It is an image of Peter’s failure and Jesus Christ's triumph. The Church is not just a community of people, but a story of sinners communing with their Savior despite their failure and because of His death on the cross. I first saw a rooster with a cross at a church in Dallas, Texas. I thought it was strange, but it peaked my interested like crazy because it wasn’t typical. It lead me to ask questions regarding the symbolism. I love that the symbolism isn't completely obvious, it makes us think and ponder. It helped us to see that just as Peter denied Jesus three times, so I am prone to wander from Christ and in Jesus Christ alone do we find grace. Real grace for my real sin. There was a time in my life when I later "rejected" the logo on the grounds that the cross was too small, that it made too much of Peter, and the basic idea that our hope is not in our grasp on Jesus, but His grasp on us. After all, we can let go, our grasp can be weak and slip. Not God though, His grasp on us is strong and cannot be severed. So with a bit of arrogance in my heart I thought the symbol failed to give a picture of how we really relate to Christ. I came back to it and I thought more about it. I realized that this is not a symbol from God’s perspective, but a symbol from our perspective. Our grasping onto the cross does not negate the reality that God has an unbreakable grasp on His Children. Rather, it shows my failure to live rightly and at the same time it shows the only hope for my sinful heart: the cross of Jesus Christ. The cross where the Church, the people of God, were redeemed as Jesus’ body was broken and blood was poured out. If our faith is in Christ then we share in the story of Peter’s denial of Jesus. But we also share in Jesus’ restoration of Peter to Himself. Peter's denial of Christ and the rooster crowing is recorded in all four gospels. This event made Peter a broken man, a man who repents and experiences grace. In the Gospel of John, Jesus is risen and shows up on the shoreline while Peter and the others are fishing. When Peter sees Jesus, he throws on his outer clothing and dives in to swim to Jesus excitedly. I see this and I think how much guilt Peter must have felt after the rooster crowed. We so often want to run away from God in these moments, to be more like Adam and Eve in the garden when naked and feeling shame they hide from God. But we see Peter do what the Gospel calls sinners to do: run to Jesus, not from Him. In John 21:15-19 there is another interchange between Jesus & Peter. Peter denied Jesus three times, here also three times Jesus asks Peter, “Do you love me?” The same three times Peter responds, “Yes. I love you” and we are told that Peter is grieved the third time Jesus asks. Surely, being asked three times reminded him again of his previous failure. But Jesus doesn’t condemn him, He doesn’t disqualify him. Instead He calls Peter to feed the sheep of God, to be a part of God’s great plan of redemption. As we read into Acts and beyond we see a transformed Peter does just that. He follows Jesus, moment by moment dependent upon the Gospel. Peter does so by grasping onto the cross of Jesus Christ every step of the way. That’s a picture of the redeemed, the people of God, the Bride of Christ, the Church. Sinners clinging to cross of our Savior. So that’s why I love this logo, it's an image of sinners looking to Jesus. Historically many Protestant churches in Europe placed a rooster atop their steeples to distinguish them from Catholic Churches. The rooster has been a Christian symbol since God used it to show the weakness of man with Peter and the triumph of Christ in the resurrection. Through the cross even the man who three times denied the Savior was forgiven, loved, restored and sent out to zealously live for the glory of God. There is hope in the Gospel for sinners everywhere. 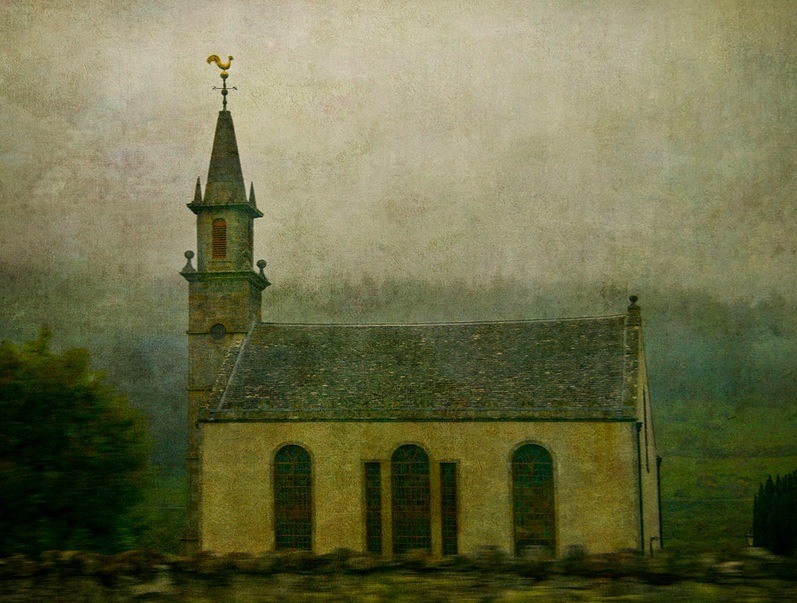 This photo is the Daviot Parish Church in Scotland.